On the arrival day the program starts in afternoon at 2 p.m. and on the last day the course finishes around noon. 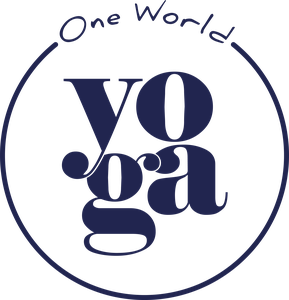 Price for the whole course including all yoga & theory lessons plus lunch (Thursday till Saturday) is 319€*/359$*. Accommodation, breakfast and dinner are not included. *Early bird till 28th of February. After 1st of March the course costs 369€/419$. Full payment is due on the date of reservation. 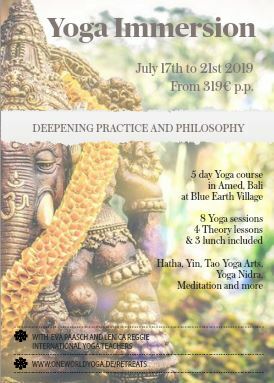 During this 5 day immersion held at the beautiful Blue Earth Village we will practice different styles of Yoga and help you to tune into your body and properly align in the postures. Our morning sessions will be more active covering styles like Hatha and Tao Yoga Art. After a short break we will introduce you into the history of Yoga and its philosophy and discuss the Yoga Sutras and how Yoga affects our body, specially our nervous system. The day finishes with more relaxing classes like Yin Yoga. 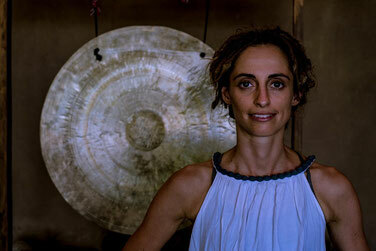 There will be a Yoga Nidra session on the arrival day and a Kirtan (chanting) on day three. This workshop aims to give you a great overview about yoga and its background as well as its effectiveness for body and mind. The course is designed for those who already have some experience practicing Yoga but are interested in digging deeper and getting to know its philosophical and anatomical background. In case you want to be part of this wonderful immersion, kindly send us an e-mail stating your full name and current address. We will then provide you with our bank account details so you can issue the full payment to guarantee your spot. Please bear in mind that we need a minimum of 6 person to make this beautiful course happen so kindly wait for our confirmation that the course is taking place before booking your flight. In case we don´t reach the minimum number of participants by the 30th of April, we will of course immediately refund the full amount (minus bank fees). Cancellation is only possible till 28th of February. In this case we will refund you 75% of the paid amount. Cancellation after that date unfortunately is not possible but you can name a friend as a replacement to take your spot. Lenica is passionate about understanding and deepening her understanding of all things related to our existence. This manifested itself as an inclination towards science and mathematics when she was younger, leading to a masters in physics. It manifested as an in-depth study of martial arts ranging from Shaolin Kungfu to Kyokushinkai Karate that then led to a deep and lasting interest in Qigong. It expressed itself as curiosity and an attitude of exploration towards her own consciousness which plunged her deeply into the world of Yoga, Meditation, Spirituality and Integral Theory. Her love for nature and the ocean led her to pursue a career in Scuba Diving and Freediving which assisted her in traveling to and living in several countries around the globe, learning new languages and deepening her connection with the sea. Teaching for her has always gone hand in hand with learning: as soon as knowledge forms there is the desired to share. She has taught Physics, Mathematics, Swimming, Karate, Scuba Diving, Freediving, Yoga and Qigong throughout her life, expanding her own knowledge of the subjects themselves and the art of teaching. It is her desire to promote continuous personal growth in all humans, and in all levels of our existence. 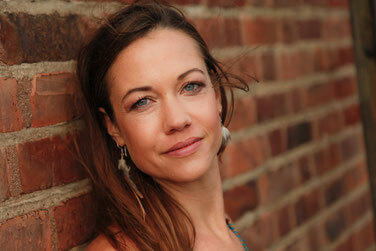 Eva is the owner of One World Yoga and dedicates her life to Yoga. After studying romance languages, anthropology and philosophy she moved to Southern Spain where she lived for some years. Back in Germany she found work in a Brazilian bank where she evolved some of her business skills. After having worked in the corporate world for more than 6 years, she decided that it was enough, went travelling for a year and dedicated herself full-time to Yoga. She has formation as a Hatha and Yin Yoga teacher and is continuously developing herself focusing in formation for different groups as seniors and pregnant women as well as specializing herself in the field of Yoga Therapy. What she loves about Yoga is that no matter how much you have learned, there is always more to it and that besides being a teacher and sharing her passion, she will be a life-long student as well. She never regrets for a second leaving her old life to focus on her dreams.